🙏 ¡Sorteamos uno cada etapa! 🙏 We giveaway one per stage! Stage 14 was another mountain day, with 5 tough categorised climbs in store, including a Cat 1 finish to Alto Les Praeres. Les Praeres is short and sharp, averaging 12.5% for 4km, so it was a difficult finish to a long day of climbing with 3000m of ascent. Typical Vuelta day. Bahrain - Merida did the bulk of the chasing in the last hour with deluxe domestique Vincenzo Nibali doing the bulk of the work, fine tuning his form for Worlds. The shark and and co were looking to set up their man Ion Izaguirre for an assault on the other heads of state on the goat track to Les Praeres . They pinned the break back with 5km to go and set up a battle royal between the GC men on the final climb of the day. An all star cast set off in the break away today that included BMC duo Nicholas Roche and Brent Bookwalter, break away king Thomas de Gent, Michael Woods, Michael Kwiatkowski and Garcia from Barhrain Merida. Fire power like this needs to be kept on a short leash and they were, relatively. Movistar and Cofidis kept tabs on the leaders until Bahrain-Merida ramped up the pace in the last 50km. The break did self destruct in a way with De Gent puncturing, to never see the front again, and Woods became a victim of a crash. The BMC duo were suffering so it was left to Kwiato to push on solo. It was all set up for a battle royal. After the work of Bahrain-Merida it was expected that Ion Izagirre would attack and put his rivals into difficulty, however the younger Izagirre bro was one of the fist GC men dropped. Kruijswijk was the fist man to attack in ernest with 3.6km to and was looking strong as an ox, only to be reeled back in with a large chunk of the work done by R. Carapaz who rolled the clock back to May. Quintana then attack twice on the steeper (it was all steep) slopes with Lopez following on both occasions, the Astana man just playing the waiting game. The Colombian duo came back with 1km and it look set for a Valverde win. However S.P Yates attacked savagely with 700m and got the gap big enough to hold on for the win to Lopez and Valverde who came in second and third. Quintana was slightly distanced in the last few hundred meters but managed to limit his loses to only 7 seconds. 3 - S.P Yates- Played the waiting game. He didn't get lured in early and had to pinned back attacks calmly. But when he did attack he made it count and went all in. Can he have a good third week? 2 – S. Kruijswijk- Always one to take the race by the scruff of the neck. Attacked early and got caught but hung in there. Becoming a real GC threat. 1 – M. Kwiatkowski- Took the race in in the breakaway and was the last to survive. Some help from Woods and De Gent would have been handy late. S.P Yates would have to be in the moving and shaking category today. Played a calm game and has looked to have learned a few things from May. A stage win and another stint in the leader's jersey. This time, he won't want to give it up. Enric Mas showed that there is something in the water at Quickstep this year. The 23-year-old was right there in the final today and is sitting in pretty, 8th on the GC. Will he get found out in the third week? 179km. Stage 15's profile is like shark teeth. Four categorised climbs with the last being a 13km @6.9% test to the finish. With the rest day and TT coming after stage 15, riders that fear the individual discipline might need to put their cards on the table here. 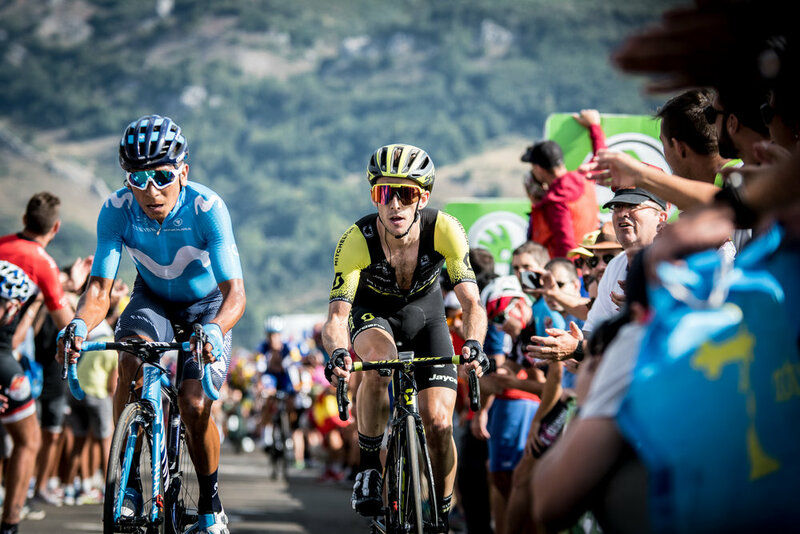 It's a stage that could favour the breakaway like we have seen untold times already, or Movistar might angle for an assault on the other GC men and make the day a living hell. From the break, we will take Majka and will go for Quintana from the peloton. This climb suits the Colombian better than the last few finals, so an all out raid from Movistar could be the flavour of the day.